Don't rummage through kitchen drawers looking for the right tools for barbequing anymore. Now you can have the four most used accessories all in one location. Kenyon gathered these four tools together and packed them in a convenient canvas carrying case. 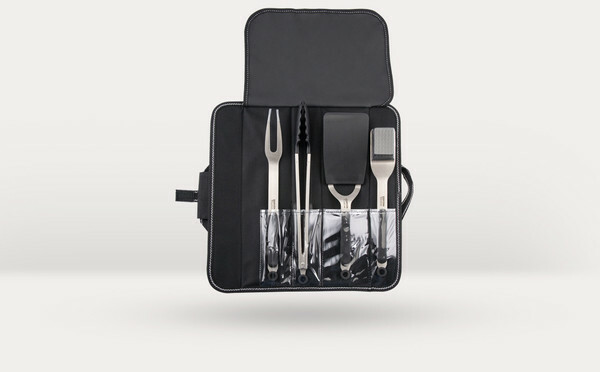 Each of the tools - a spatula, fork, tongs and grate cleaning brush - are made from high quality stainless steel that complements your Kenyon grill. The soft-grip handles allow you to firmly but comfortably hold the tools. When you are ready to clean them, the handles can be removed and all parts are dishwasher safe. Pack the utensils back in the case and store it right inside the grill lid for next time.